A muddled collection of good ideas, Impire has charm enough but its flaws are likely to frustrate most players. Impire is not Dungeon Keeper. It's important you remember that. Although peopled – or imped, if you will – by long-eared, razor-toothed denizens, this RTS-meets-dungeon-simulator is less about running an evil underground empire than middle management in the lower echelons of a slow-witted, weight-watching hell. "None of your minions wants to do anything on their own." I assume they're weight-watchers, anyway. Certainly none of your minions seems to want to eat of their own volition. No one seems to want to do anything on their own. Your creatures can spend days gallivanting past the fetid innards of the local kitchen without so much as a second glance inside, or acknowledgment of the fact that they've starved themselves into impotency. Workers will not run when intruding heroes are hacking at their ears, they'll just... stand there, taking it. And unless they're on patrol or have been explicitly told to do something about it, your units will ignore suspicious ladders up until the point where uninvited guests drop in and they're forced to look incredibly surprised about it all. Impire is a haphazard patchwork of not-quite-thought-out ideas and occasional glimmers of brilliance. It's a multi-layered affair that wants you to oscillate between the traditional isometric perspective of real-time strategy games and the overhead map of its management mode – except everything is just plain better accomplished from a bird's eye view. It wants you to build mushroom farms, nurseries, prisons – where you can hold errant do-gooders – seedy dives, workshops and more, but fails at making the process as satisfying as it should be. "It's chock-full of niggling problems and half-baked concepts." Instead of giving you the keys to the proverbial kingdom, Impire has you enlisted as a pro bono city planner stuck working around pre-existing architecture, ho-hum interior design and the understanding that, once constructed, nothing can ever be destroyed. Impire is chock-full of niggling problems like these, half-baked concepts that probably could have used more time in the development oven. Point-and-click overworld raids (you really don't do anything but point and click here), a finicky UI that demands you do things like navigate with the WASD keys as opposed to simply waving your mouse cursor around, the constant need to cancel your jaunts into the unknown to fend off encroaching heroes and feed your servants, a teleport spell that is ridiculously exploitable – these all could have been done better. There are things to like here as well. The narrative is cheesy and over the top, garnished with decent voice acting. Impire makes it clear that this tale of Baal-Abaddon, indentured servant of a bumbling demonologist who bears no small resemblance to Doctor Evil, is not one to be taken seriously. 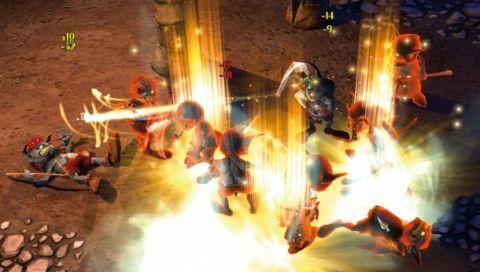 While it can't quite make up for the lack of self-preservation instincts in your minions, the Dawn of War-like squad system bears mention as well, due to the appeal of mixing and matching your units for the best skill sets, dressing them up in progressively better equipment and piling them on suspecting foes. The RPG stylings of the upgrade system? The panoply of traps? The enemy-infested, trap-riddled communal dungeons? The ability to gain free units via wanton gambling? Pure silver, if not gold. Like the whiskey-soaked eccentric uncle that no one approves of but who's invited to the party anyway, Impire demands patience and a willingness to forgive. It's decent where it could have been great – a missed chance to make a cult classic.